Fort Worth artist Etty Horowitz and landscape architect Kevin Sloan have, for the past seven years, carefully designed a public art monument welcoming visitors to Fort Worth. The sign spelling out Fort Worth was slated to greet visitors at Interstate 30 and Eastchase Boulevard, next to Pantego Bible Church on the city’s far east side. “It is almost as if they would see the Hollywood sign,” Horowitz said of the public art commission made from readily available materials, such as bricks from Fort Worth-based Acme Brick, steel and other materials part of the city’s identity, and placed atop recycled traffic barriers. Envisioned as an old road to the west, it, unfortunately, after years of community meetings and conversations about the city’s identity — should it include cowboy hats and longhorns? –– hit a few of its own barriers along the way. The latest came when the Texas Department of Transportation recently halted the project, citing plans to expand the highway onto the land. As of a year ago, the project is no longer considered a “designated gateway,” instead a “monument, landscape and art” project greeting drivers from the north at State Highway 121 west of Maxine Street and east of Beach Street. The challenge now is fitting the original plan situated on a hill onto a flat and narrow surface. So, now, the Israeli-born artist may have to redesign the project. As she waits, however, she still has plenty of other commissions to work on. Horowitz was trained as an architect and has created public art installations for the past 20-plus years; her architectural background drew her to building sculptures. Among her latest is a set of life-size abstract sculptures at the new Boulder Draw Park in Frisco. The black-and-white cartoon-like statues are flat but three-dimensional. Completed in December 2016 and abutting James R. Newman Elementary School, the 10 sculptures were commissioned by the city of Frisco. The doodles also include a family of three, two boys with a ball and others. They were installed in 2017. Typically, when people consider public art, they think about a single monumental work. The works may be grand, but they are not interactive. In some cases, sculptures in parks also distract from the natural environment. Horowitz convinced Frisco city officials that the best design would be human-sized, black-and-white sculptures designed for interaction. “When they are human-size, people can interact with them,” she said. The one-inch thick metal statues were designed and fabricated on a computer as part of her practice of incorporating technology into her work. The doodles were inspired by Alexander Calder’s doodle drawings, as well as the works of Julian Opie. The doodle figures are interactive and spark conversation. Public art is inherently interactive. Horowitz wants to bring art to the people in public spaces, where people are more likely to see it. Public art, like a building, is an inherent part of the built environment. The final work is as interactive as the process for her. She interacts with people during the process, too, with other architects, engineers and fabricators. “It’s a team effort,” she said. For another project commissioned by the Fort Worth Public Art commission, Horowitz met with neighborhoods in southwest Fort Worth for input on a sculpture for the Chisholm Trail Community Center. Ocean of Grass is a prominent feature made of steel tubes placed in front of the metal entrance of the otherwise average brick and mortar community center. At the entrance of the center, the intertwining and twisting stainless steel tubes look like prairie land. The design was the result of hearing neighbors talk about the region’s vast prairie. Sometimes Horowitz does not just listen. She talks, too. Last summer, officials with the Kimbell Art Museum approached her to speak as part of its The Artist’s Eye series. Moderated by Kimbell staff, artists and architects relate their works to a work in the general collection. Horowitz discussed the Dutch artist Piet Mondrian’s influence on her work. She chose Abstraction, an oil painting that is part of his grid painting series of black, white, red, yellow and blue horizontal and vertical lines. Her interest in the work highlighted the relationship between art, architecture and outdoor sculpture. She also mentioned Louis Kahn, the late Jewish architect who designed the Kimbell’s iconic first building. She described the work from an architect’s point of view, looking at the composition and balance. “When you study art, you are looking at the principles of design,” she said. 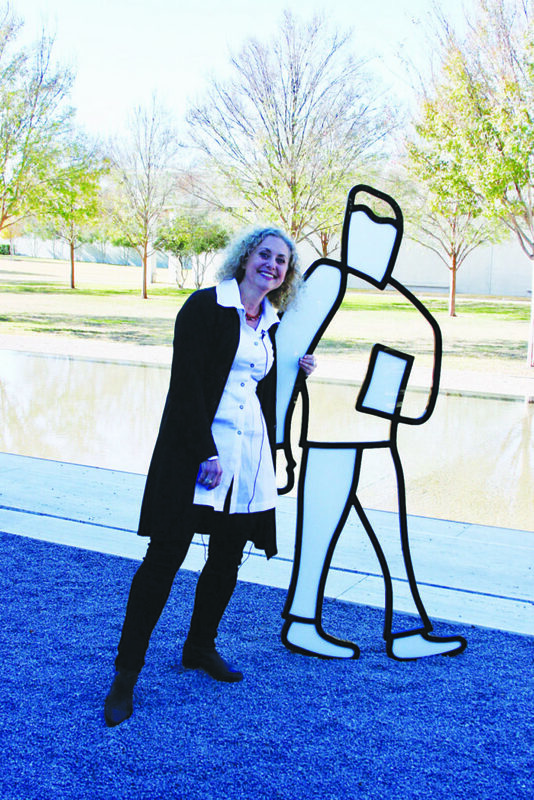 She created a plastic sculpture, Man with Book, similar to one of the Frisco sculptures, and brought it to the museum, where it is displayed and installed outside the museum near the water. Horowitz is working on two new pieces of sculptures: a set of works small enough to fit on an easel and smaller sculptures of the doodle figures. The smaller doodle figures stand at about 1 foot. They are intimate enough where you still interact with them. The new work is appropriate for gallery or museum spaces spaces, yet still interactive.